Senior Senator and Eric Poretz sail over the second fence in the Open Timber Race. 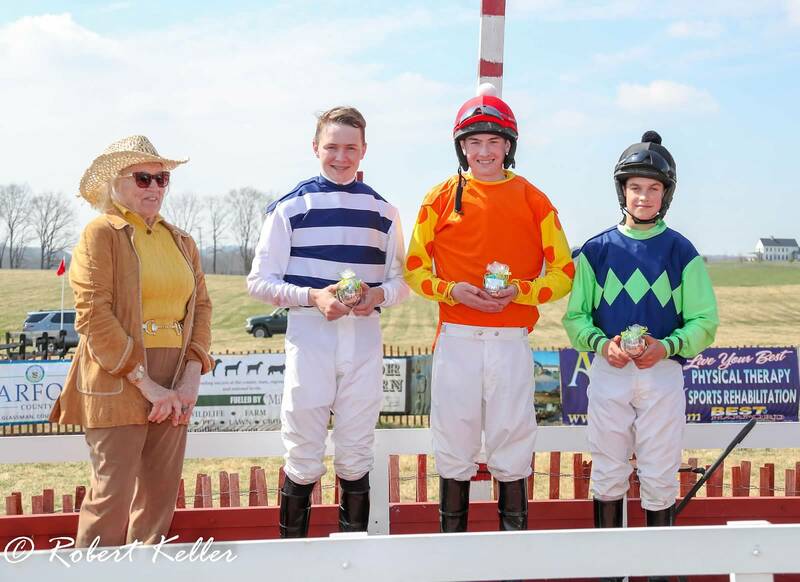 The second race meet of the 2019 Governor’s Cup Series was a warm, sunny day at Atlanta Hall Farm in Monkton, MD. 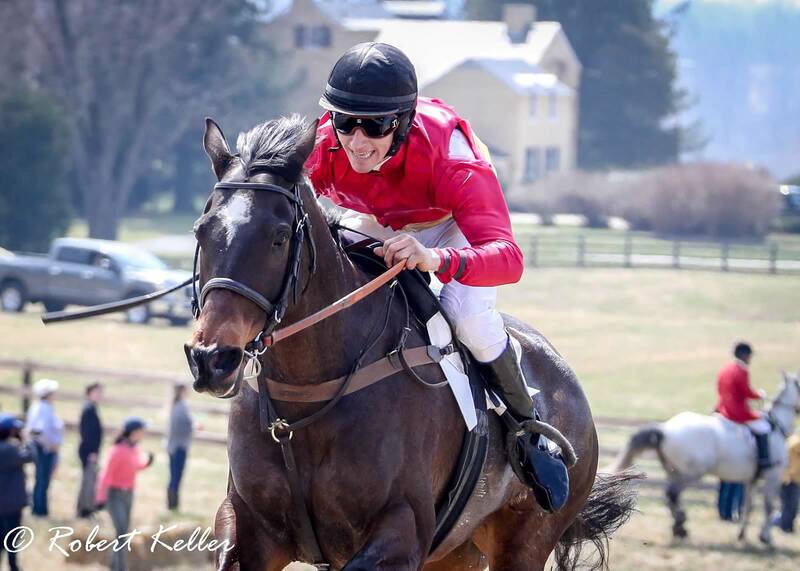 The Elkridge Harford Point-to-Point offered pony, timber, and flat races and attracted seven Maryland Hunt Cup nominees: Senior Senator, Biedermeier, Wildcatter, Raven’s Choice, Ride Away, Vintage Vinnie, and Sumo Power. Trainer Joe Davies and jockey Eric Poretz teamed up to win three of six races including the Edward S. Voss Memorial Open Timber Race. Irvin L. Crawford, II’s Senior Senator bested Biedermeier by two lengths in a wire-to-wire victory. Senior Senator is a two-time Maryland Hunt Cup winner (2016, 2018) and will look for a third win and a chance to retire the trophy on April 27. Eric Poretz drives Some Response to the wire. The second Davies, Poretz duo victory came in the next race, the George C. Clement Memorial Novice Timber. Some Response, an Irish bred owned by Armata Stables, bested the rest of the field by twenty lengths. Taking home the third victory for the team was Vintage Vinnie, another Irish bred owned by Armata Stables and a Maryland Hunt Cup nominee. The winning time was 6:34, the fastest timber race of the day. Raven’s Choice and Paul O’Neill clear a fence in the Heavyweight Timber Race. Trainer Todd Wyatt and jockey Paul O’Neill had an equally successful day, winning three races and making the day’s victories an even split. Maryland Hunt Cup winner (2015) Raven’s Choice made it to the wire in front of Pennsylvania Hunt Cup winner Stand Down in the Ann L. McIntosh Memorial. 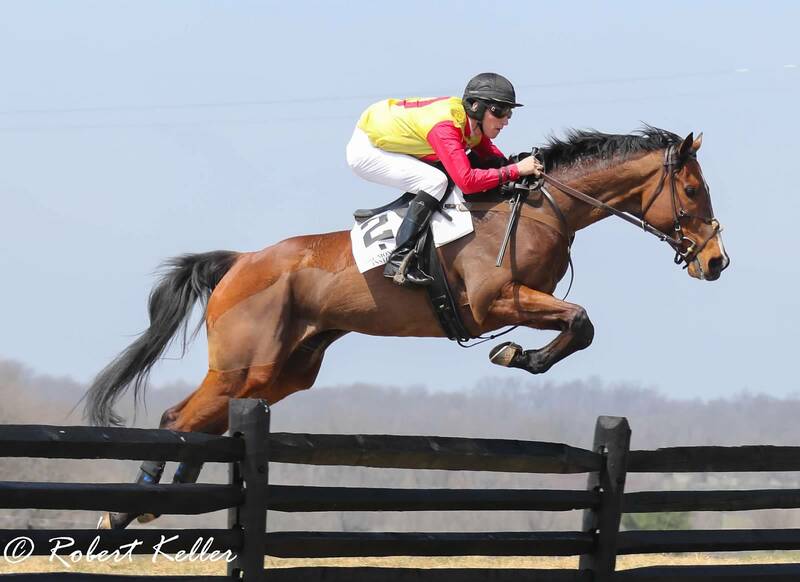 Raven’s Choice is owned by Ann Jackson and is nominated to run in the Maryland Hunt Cup again this year. Wyatt and O’Neill also teamed up to win both flat races of the day. 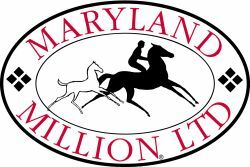 Robert J. Masiello’s Cotton Town won the Alfred J. Smithwick Memorial and Flash Jackson, another horse owned by Ann Jackson, held on to a two length victory in the Sara Bosley Secor Memorial. 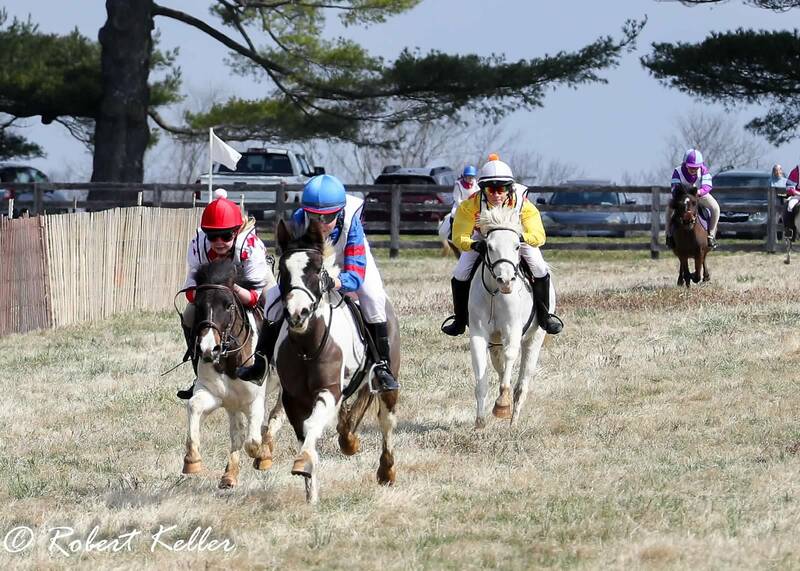 Junior riders gallop to the finish line in the Small Pony Flat Race. For the first time since 2012, a full card of junior and pony races were run. EHM Stables had success in the pony flat races for the second weekend in a row with Thomas Houghton and Lickety Split winning the small pony division and Teddy Davies and Rosemel’s Tickle Me Pink winning the medium pony division. Parker Hendriks, Colin Smith, and Austin Belt, winners of the Junior Field Master’s Chase. In the Junior Field Master’s Chases, Catie Keil’s Domino Effect won the medium pony division with Austin Belt in the irons. Colin Smith piloted Mimi Schmitz’s Balls to the Walls to take the large pony division and Parker Hendriks won on Lawn Ranger for Sanna P. Neilson in the thoroughbred horse division. 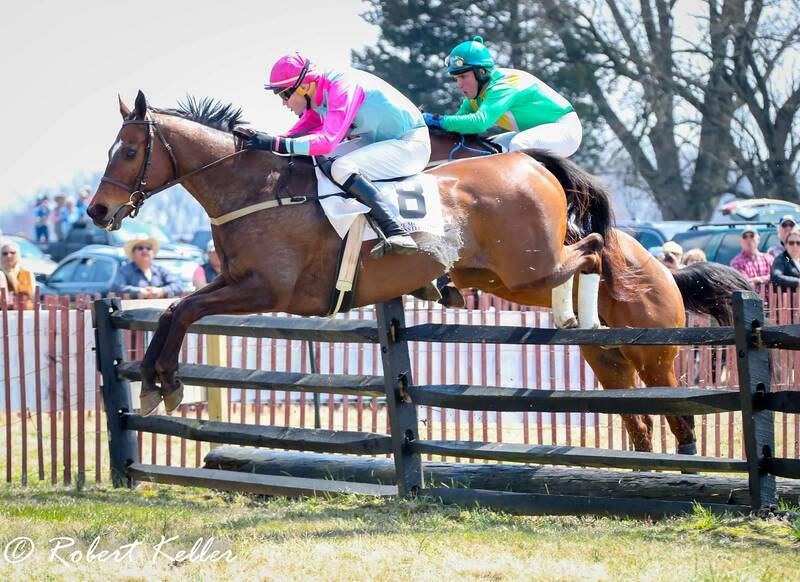 Next up on our schedule is the My Lady’s Manor Steeplechase on Saturday, April 13. To see all of Robert Keller’s photos from the day click here.